Last week an article was published in The Bull and Bear titled “Capitalism is Ending Poverty and Solving Climate Change. Socialism Is Incapable of Doing Either.” The article argues that poverty and climate change are being solved by capitalism, making the current system the best way for the world to continue to grow in a sustainable manner. Here, I’m seeking to challenge that assertion by providing an alternative perspective on capitalism’s viability as a sustainable economic and political system. I want to discuss the real negative effects capitalism has had on international development, namely through exploiting developing nations to uphold the success of the developed world. Further, I want to contradict the idea that capitalism is the reason poverty and climate change are being addressed: in fact, those issues can be seen as a direct result of the capitalist system. Capitalism is at the source of many structural issues in society. It promotes economic growth, but also perpetuates inequality in both income distribution and power relations, often at the expense of the well-being of the poorest members of society. If countries want to continue to prosper, they need to promote plans for sustainable growth that capitalism simply does not support. Capitalism is defined as an economic system where the factors of production are owned by private entities, not the government. The pursuit of profit is the prime objective in such a system. In theory, profit and wage are set through competition so that both firms and labourers profit. However, theory does not necessarily represent reality. Firms can increase their profits by slashing wages as much as possible. While the basic rules of supply and demand clearly affect wages, the competitive equilibrium does not necessarily guarantee a livable wage. When the government does not provide protections like a minimum wage, companies will inevitably exploit workers through lower wages in order to increase their profits. The basic tenant of the capitalist system is that workers and companies have competing interests. Before unions were widespread and established within the U.S., employees could not bargain collectively for wages that would allow them to live comfortably. Even today, the minimum wage argument is still contentious. The current federal minimum wage has not been adjusted for inflation and is much lower in real value than it was in the 1970s. Raising the minimum wage to a living wage is seen as detrimental to economic activity, as falling profits would discourage firms from conducting business in the areas with the higher wage. However, exploitative wages can also have a negative effect on the economy by reducing the overall amount of disposable income that low wage workers have, not to mention the moral implications of paying the lowest earning portions of society less than a livable wage. The defense of low wages can be seen elsewhere in the world today. For example, many multinational companies take their factories to countries where they can pay workers less to increase profits. Capitalism as an economic system in practice relies on private profit to the point where welfare falls to the wayside. In order to justify exploitative wages, capitalist society, especially in the U.S., encourages the narrative hard work and dedication as conducive to economic success. However, class mobility is not that clear cut. The vast majority of people will end up in the same income bracket as their parents. Those with the greatest chance of success to become truly rich are people who are born into middle class and upper middle class families. Money begets money. Poverty begets poverty. For many, the best or only path to social mobility is education, but in a capitalist society higher education is not easily accessible. While barriers against marginalized people are slowly being removed, university is becoming increasingly expensive, creating effective economic barriers. This is one example of the many ways that countries construct economic and political systems with only a certain class of people in mind. When people who fit this default cast succeed through hard work, they are used to uphold the narrative that capitalism benefits all who work hard. This narrative ignores systemic barriers against economically or otherwise marginalized people. Not only does capitalism promote inequality within individual countries, but it also reinforces unequal international relations. In order for wealthy countries to have cheap and affordable goods, they must rely on poor countries to supply inexpensive labour and resources. Dependency theory proposes that colonialist countries continue to benefit from unequal power relations with former colonies through the global capitalist system. While, like most theories, dependency theory has flaws, its basic principle is still valid. Developed countries rely on them to provide necessary goods at little cost, which means the minimum wage in countries is far below the living wage. For example, minimum wage in the UK ranges from £3.50 to £7.50 an hour, whereas in India, a former British colony, the minimum daily wage in Delhi ranges from £4.56 to £5.54. The lowest paid worker in the UK can make more in 2 hours of work than a skilled worker in India can make in a day. In line with this, Foreign Direct Investment (FDI) in India by the UK exceeded 13 billion pounds in 2011, compared to just under 3 billion pounds from India into the UK. Because of a long history of exploitation, former colonies do not have the independent economy to provide a market big enough to sustain certain industries without developed countries, nor can they develop independently from the world market. This power imbalance mimics the unequal power relations within developed countries. While poverty has gone down and is continuing to decrease, this is not inherently a product of capitalism. Economic growth has lead to increased income and quality of life for many people, but if it weren’t for re-distributive policies, this money would have stayed in the hands of very few people. Capitalism promotes the idea of profit as the bottom line while ignoring the realities of poverty and failing to promote social welfare programs. The pursuit of success and profits can mean exploiting cheap labour or actively contributing to climate change. Last year, Martin Shkreli, the CEO of Turing Pharmaceuticals, raised the price of AIDS medicine from $13.50 USD to $750 USD. 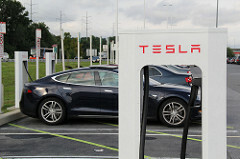 This extreme case exemplifies exploitation justified by capitalism — to increase profit margins at all costs, even the lives of the poor and ill.
One might point to companies such as Tesla to show that capitalist companies are benefiting the world by supporting environmentally friendly business practices that are beneficial to society as a whole. 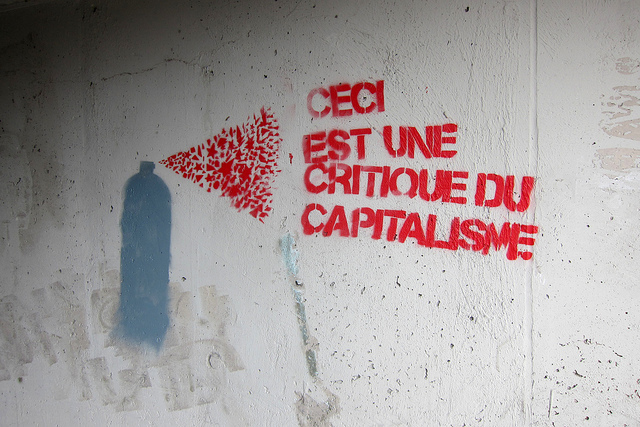 However, capitalism itself does not support environmental protection. Protecting the environment does not inherently lead to profit, so it is not a desirable goal for most companies. The Keystone and Dakota Access pipeline are predicted to cause massive damage to the environment, not to mention a massive amount of distress to indigenous groups, but are being implemented despite those facts for company profit. Similarly, Volkswagen was found to have created technology to lower carbon emissions while cars were being tested. This enabled the company to market their cars as environmentally friendly without investing in actual sustainable technologies, which would presumably increase costs. Many more major corporations actively ignore the environmental repercussions of their actions in order to profit, exemplifying the way capitalism prioritizes profit over long term sustainability. Furthermore, Tesla’s open patent on certain technology is itself anti-capitalist in that it encourages innovation and allows others to profit off of their technology. However, the actual execution of this promise has been inconsistent. If companies willingly shared their research, there could be huge beneficial implications for scientific and medical research. However, most companies cannot afford to lose the money spent researching by not patenting profitable intellectual property, be it in the form of lifesaving drugs or more efficient technology. A research culture that is not based off of the capitalist pursuit of profit could allow for a greater degree of knowledge sharing and innovation and increase the speed of progress. Capitalism is often argued as the only possible system because of failings of communism in the 20th century. Communist authoritarianism has been responsible for millions of deaths around the world, notably in the Soviet Union and China, but it is not representative of socialist ideologies today. There are a broad range of ideologies that fall under the title of socialism that are viable alternatives to certain capitalist practices. For example, market socialism maintains the uses of the free market while incorporating greater re-distributive policies by the government. Another example would be democratic socialism, which most recently garnered attention in the U.S. because of the presidential campaign of Vermont senator Bernie Sanders. It includes proposing universal health care and a living wage through the mechanisms of democracy. Socialism has policies that have been shown to narrow the wealth gap, which is one of the clearest indicators of poverty reduction. Student anger at the capitalist system is largely based around the ideas that I’ve expounded upon in this article. 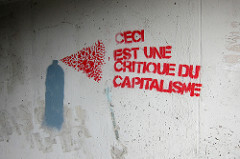 Those who criticize capitalism are criticizing the systemic barriers that are in place that curtail social and economic mobility among marginalized people. The idea that hard work will lead to inevitable success is only true for an extremely specific kind of person. In order to remedy the negative effects of capitalism, government policy must account for its historical context as well as its current realities that prevents equal opportunity and exploits the poor. Socialist policies offer key insights into how society and the global economy can continue to progress in a way that benefits the greatest amount of people possible through sustainable growth. Capitalism does not need to be defended. It is not harmless or progressive, and society must recognize the failings and inequalities inherent in the current system.